When I wrote about Bunny Bread the other day, folks immediately started remembering that Bunny Bread was a sponsor for Crusader Rabbit on KFVS-TV. 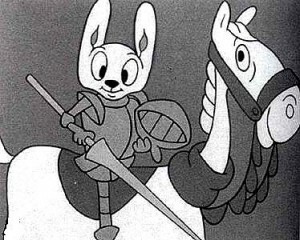 Crusader Rabbit was the first animated series produced specifically for television. The first episode, Crusader vs. the State of Texas, aired on KNBH in Los Angeles August 1, 1950. Kid Matt, who has a Bunny Bread T-shirt, but had never seen Crusader Rabbit, found a bunch of the cartoons on YouTube. Episode 1 sounds vaguely topical these days. Crusader Rabbit is headed to the great Southwest because he heard a radio news report that “the Texans are chasing all of the jackrabbits out of Texas.” He was headed down to help his cousins, all of whom were named Jack. Along the way, he enlists the aid of his trust sidekick, Ragland T. Tiger (Rags). Each episode was broken into as many as 30 chapter, insuring that you’d have to be glued in front of the set every day to keep from missing the story line. “Crusader’s basic formula was simple — humorous adventure stories told (by narrator Roy Whaley) in short episodes, with cliffhangers, about a little smart hero (Crusader Rabbit, voiced by Lucille Bliss, who many years later was the voice of Smurfette), a big dumb hero (Rags the Tiger, voiced by Vern Loudon), and an inept recurring villain (Dudley Nightshade, voiced by Russ Coughlin). 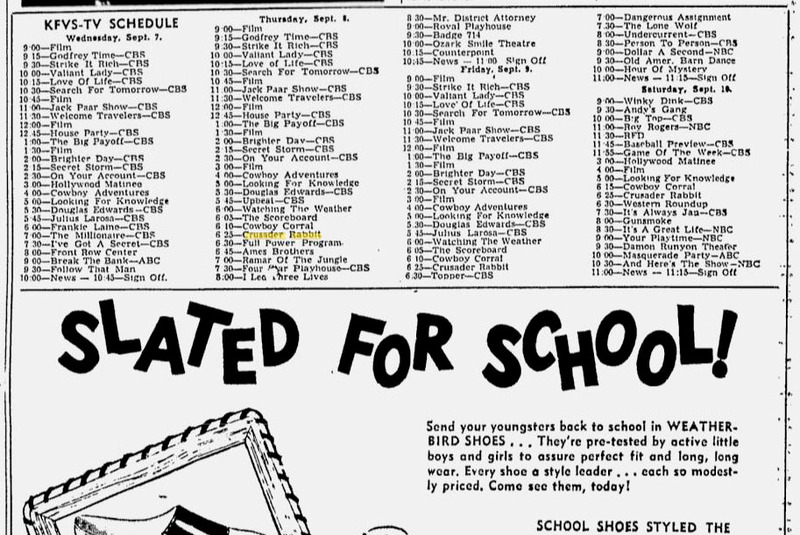 Ward would later become famous for another animated TV series with that very same formula — Rocky & Bullwinkle. Rats, did CR end up as a stew or did the Texans run all the rabbits out of Texas? I’ve never heard of Crusader Rabbit before today ~ but this does bring to mind the old Cactus Pete show that aired on the ABC affiliate, WSIL. When I was a kid, each half hour consisted of a b&w Space Angel cartoon, Deputy Dawg and The Funny Company. All three atrocious cartoons, but there wasn’t anything else to watch! After Crusader Rabbit ended, we watched Winky Dink and used the magic screen and crayons to help solve the mystery. Tell it to take a drink of water, hold its breath, pat its head while rubbing its tummy. It won’t cure the hiccups, but it’ll amuse you. 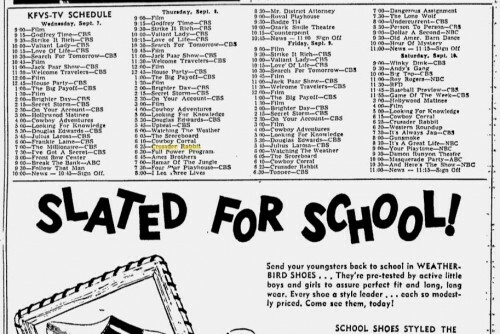 I guess now’s as good a time as ever to ask if anyone remembers Don McNeely with a program (can’t remember the name)where “Everyone watch the Birdie” was mentioned? Please tell me I’m not losing it, but it seems like it was only on for 15 minutes (no more then 30 minutes) but was like a contest form of show. By the way, Winky Dink’s magic screen rocked.